Below you will find a list of all the Happy Hugo Casino bonuses - offered to new players. The right side offers a casino overview (click to scroll through the images). Happy Hugo Casino is a brand new gambling website that Canadian players can join in 2016. The site is licensed by Curacao and their mission is to bring the best value with the most popular games and bonuses to players. The Happy Hugo casino bonus for new sign ups is $1000 and the games can be enjoyed on mobile and desktop. The focus of HappyHugo is fun and they are plenty of payment methods as well as fast withdrawals. Happy Hugo online casino is brand new and as such, they haven't had much time to build their brand or reputation. In saying that, in a recent interview with the brand manager, we were happy to discover that the company has many years of experience in the i-Gaming industry and there are sign ups from a number of cities in Canada including Surrey and New Westminister in BC, Brandon MB, Sherbrooke to Saguenay QC, and more. We will be keeping a close eye on how things progress with this new online casino and we will update this review accordingly. All the details for the Happy Hugo casino bonus can be found on the Club Hugo page. There are terms and conditions attached to the bonus and players should be aware that the bonus money is non-cashable and will be removed from your balance when you request a withdrawal. The minimum deposit required to redeem any bonus offer is $20 and the maximum bet you can place using bonus money is $10. Free spins have no wagering requirements. There is no mention of wagering requirement in the terms and conditions. 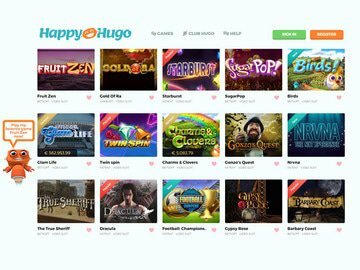 There are plenty of ongoing promotions at HappyHugo casino and again these can be found on the Club Hugo page. There's the Hugo VIP club and once you sign up as a new player and claim the welcome package you will be automatically entered into the Club Hugo VIP Program. There are different levels to the VIP program and the higher you go the better the deals you receive. Happy Hugo Casino is powered by a number of top software brands including Evolution Gaming, Betsoft, GameArt, iSoftBet, and NetEnt. The casino is available in no download instant play format and is fully mobile compatible. The casino is also available in a number of languages including English, French, Portuguese, and Swedish. Happy Hugo offers a huge range of casino games including virtual and live dealer titles. Most of the games can be played in free demo mode for fun, and in instant play flash for real money on mobile, tablets, and desktops. The games categories include All Games, New Games, Slots, Table, Live, Video Poker, and Jackpots. You can also sort games by provider and popularity to help you find exactly what you are looking for. The most popular titles at the moment are Secrets of Atlantis, Pyramid: Quest for Immortality, both provided by NetEnt. Other popular titles include Platoon, When Pigs Fly, Storming Flame, Aloha Cluster Pays, Fruit Zen, Birds, and Gold of Ra. Under the Jackpots category players will find a large selection of Betsoft and NetEnt progressive slots. These include Glam Life, Icy Wonders, Tiki Wonders, Greedy Goblins, and more. There is a total of 23 progressive jackpots titles that you can play. There are 38 table games available including a number of variants for blackjack, roulette, and baccarat. Players can also enjoy craps, Pai Gow, Poker3, Texas Hold'em, and more. Under the live casino section players will find the NetEnt Live Casino. The Video Poker category has 10 different titles to choose from including Bonus Poker, Bonus Deuces, Double Bonus, Deuces and Jokers, and a number of multi-hand games. There are plenty of banking options available to players but it should be noted that you won't find that much information on the casino website until you sign up for an account. Once you log in you will have access to the deposit page where you will find a full list of payment methods. We can tell you that they do use Neteller, Skrill, PaySafeCard, Wirecard, credit and debit cards. Canadian players will be delighted to know that they can play in CAD. There are other currencies available too including AUD, EUR, NOK, NZD, and SEK. The minimum withdrawal amount is $80 and the maximum withdrawal amount is $10,000 per week. Customer support is available via live chat and email and is available in a number of languages too. These include English, French, Portuguese, and Swedish. There is also a help page where you will find the answers to some of the most frequently asked questions. We found the customer support to be very helpful both on live chat and email. 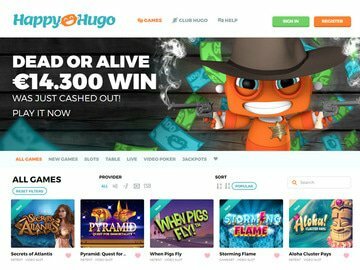 The Happy Hugo casino bonus for new players from Canada is $200 on your first deposit, with more substantial offers coming in on subsequent deposits. There is no bonus code required when redeeming any of the promotional offers. Canadian players can play in CAD and French is one of the supported languages. All in all, this new online casino has something for everyone and an excellent suite of games that can be enjoyed across all devices.